If you don't already have a Protective Topshirt, we strongly recommend that you also add it to your basket. The back leg sleeves will NOT stay on without it. 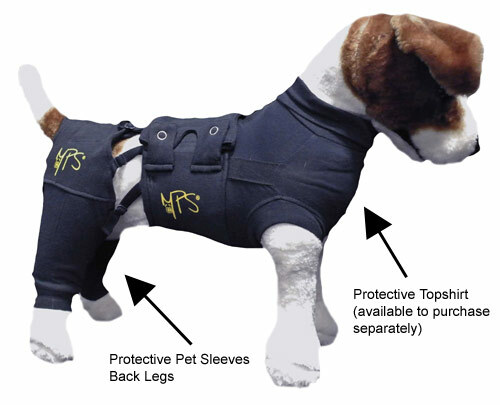 Protective Pet Sleeve is specifically designed for the anatomy of a dog. 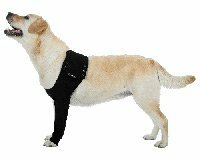 These back leg sleeves offer protection for leg wounds, recovery after cruciate ligament surgery or general protection of stitches or bandages after a back leg operation or injury. Can also be used for skin conditions, allergies etc. 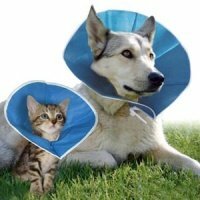 Reduces the need for cumbersome Elizabethan lampshade and recovery cones and helps the dog to retain their freedom of movement. IMPORTANT - Please note that both back leg sleeves must be used at the same time, even if only one leg needs covering. Please also note that, unlike the front leg sleeves, these back leg sleeves DO NOT stay on the dog without the additional use (and purchase) of a Protective Topshirt. If you don't already have a Topshirt, we strongly recommend that you also add it to your basket. The back leg sleeves will NOT stay on without it. The Topshirt keeps these hind leg sleeves in place with integrated loops on the rear side of the vest. Supplied as a pair (left and right hind legs). Easy to use and simple to attach to Topshirt. Hips, back and front made from soft double layer cotton. The rear of the sleeve is made from a cotton/Lycra mix. Measure your dog's inside leg. 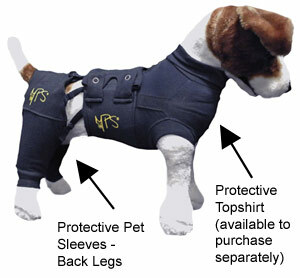 The video below shows Medical Pet Shirt, Topshirt and Leg Sleeves. This second video shows how to connect the back leg sleeves to the Topshirt. I bought the MPS protective leg sleeves and top shirt for my Jack Russel following cruciate ligament surgery; she wasn’t particularly happy at having to wear them, but they did exactly what they were supposed to - stopped her from licking the wound without having to wear the cone of shame, which she hates even more! What I love about this product is you don’t have take the leg sleeves off for toileting. D for Dog provided a great service with next day delivery, and after doing a bit of internet reasesrch I found that they were the cheapest suppliers of the MPS leg sleeves and top shirt. I’d definitely recommend D for Dog and will be buying from them again. Thank you for a great product and great service! I now have two of these so that I can wash one. Great quality and fits my dog a treat stopping her from licking her hind leg. Highly recommend. Also the staff are amazingly helpful...thank you! This is a great way to protect your dog's back legs from licking etc. Made from high quality material and crafted well. Works well to stop dog licking etc. Highly recommend. An ingenious piece of protective clothing with very good quality. Very good to use once you've got the 'hang' of it. Many thanks. I purchased the back leg sleeves due to my dog scratching her legs continually, leading to hair loss ( she suffers from allergies) she also wears the medical pet shirt because of this. 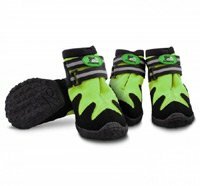 Although this isn't the answer to her allergy problem, these have been invaluable to my dog,and us,has she no longer scratches or tries pulling her hair out and is so much more content and relaxed wearing these, they must act as a calming shirt for her as well. Excellent delivery and good quality items. 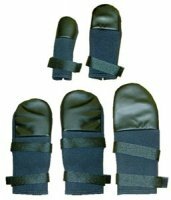 Used with the protective top shirt, this combination has provided excellent comfort and protection for our dog who had a severe and extensive scald to his hind leg and back. 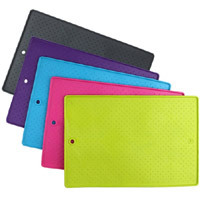 Product very well made, thoughtfully and cleverly designed to provide a perfect individual fit. Our dog loves wearing his outfit and is not inhibited or restricted by it. It has been doubly beneficial in recent sub-zero temperatures.